Last year we had two new trees planted in the garden, both of which survived the winter and are beginning to bud! Here's a little more information on the trees. Why were the trees were removed? The center area tree was nearing the end of its life. If you looked at it from far away it had grown very thin in it's branches (in contrast, the tree near the Tremont gate, is very full). The final blow was getting hit by lighting last year, with caused additional damage. With all those issues, we didn't to risk the tree dying or falling over and causing damage, so we had it removed. The other tree removed, near garden B133, was a white mulberry tree. While healthy, its growth was out of control. It heavily shaded around 20 gardens; and it seemed like the more we pruned it, the faster it grew. Financially, we could not keep up with pruning, so we had this tree also removed. The new trees we planted are shown below. Both trees are native to the area and will provide for the local wildlife as well as the garden's beauty. In the center area we have a Hop Hornbeam or Ironwood tree. 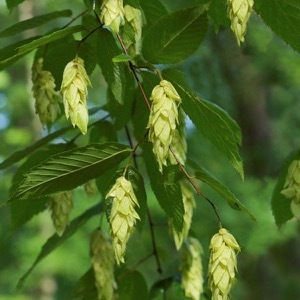 A larger tree, it produces nice leaves all summer long, with a hops-like seed that will provide food for our birds. Its also a tree that will grow well in drought or poor soil (once established) so it should last a long time in the garden. Read more on Wikipedia or on this UKY web page. 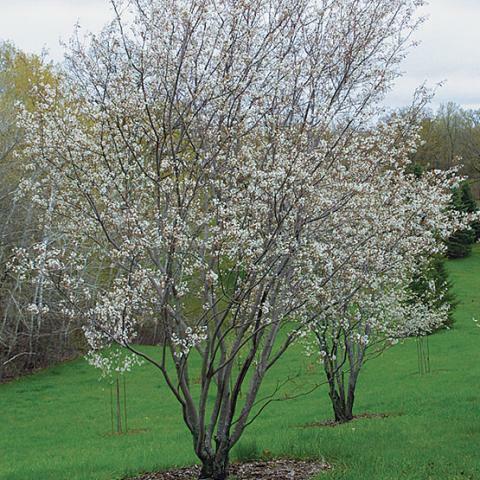 South of the center area (near garden B133) is a Serviceberry. A flowering tree that won't get too high. Spring brings a nice white flower, followed by green leaves through the rest of the season that turn a fiery red in the autumn. The pollinators will love the flowers, and the birds will love the small berries. Read more on Wikipedia, and on this web page.